Costa Rica: I was off for a 4-mile walk in hope of catching a glimpse of a sloth. The trail was in a wooded area along the beach. There were Christ Lizards, so called because of their halo-like headpiece. There were 3-D spiderwebs in the shape of boxes. A Blue Morpho Butterfly with a 6-inch wingspread startled me when it touched my hand. There were monkeys of more than one sort swinging high up in the trees. But alas, no sloth. Before turning back, I went in for a swim. (Does a sloth like to swim?) The water felt smooth and warm. Then on my return, after having left the trail, I headed to the parking lot. What did I see? This sloth hanging out by the nearby dumpster. If it was there at the start, I may have foregone such a wonderful walk. 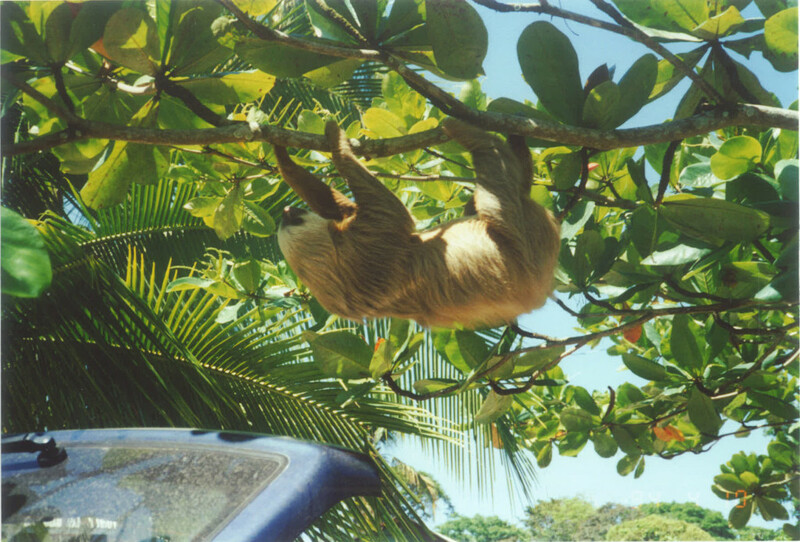 Click here for the World Animal Foundation’s fact sheet on sloths. Click here for another post on Costa Rica.